Because sometimes a good slab of beef cooked to perfection can do wonders to satisfy the palate and the soul. This down-to-earth steakhouse has a simple mission, promising to deliver honest, fragrant and thick steaks that have just the right doneness. Their emphasis on "simply good food" has won a number of fans who swear by Maria's Steak Cafe's food. Situated over at Isetan's basement food court called The Market in Lot 10, Tamaruya offers a simple yet effective premise – pick your own cuts, pay and decide if you'd like to pair it with rice and miso soup (of which we recommend), and let the cook know your doneness preference. Simple yet tasty, this is one low-key steakhouse that will hit the spot. Keeping up with the no-frills vibe, Grub by Ahong & Friends offers good steak with an affordable price at one trade-off, the restaurant employs a semi self-service style. But the trade-off is worth it, as you'll get to enjoy juicy steaks just the way you like it. Moving over to somewhere closer to downtown KL, Brasserie Fritz has been winning diners over with their French approach to fine-casual fare. If you're looking for good steak at a fairly reasonable price when in Bukit Bintang, the restaurant does a fantastic steak fritz (grilled rib eye, almond butter, pommes Fritz and baby beans) and steak au poivre (pepper rubbed striploin, green pepper sauce, pommes fritz and baby beans). If you want your steak raw, there's also a wonderful beef tartare. One of the pioneers of introducing dry-aged beef here in KL, The Beato Aged Steakhouse started in Publika and has a second outlet in Telawi, Bangsar. Their steaks are incredibly flavourful, of high quality and always hit that mark. And don't even get us started on their sides. If you're looking for a good piece of meat, this is it. 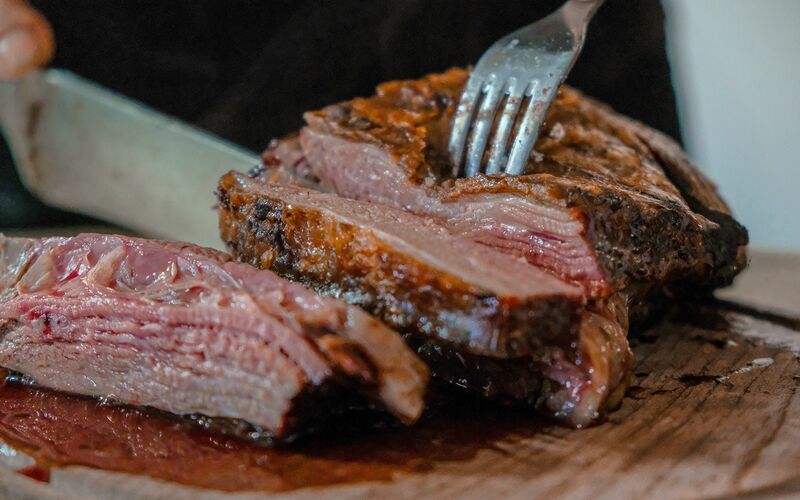 Another popular steakhouse, N97 in Bangsar is all about well seasoned slabs of beef. Diners swear by their tomahawk, which they also use to make a fried rice to round out the meal. Whatever your craving for beef, this place can sate that itch. Australian beef is the focus here at Mandarin Grill, one of the city's most popular hotel steakhouses known for its wine and steaks. Start with a diverse range of appetisers such as baked escargots or a crisp summer salad before moving on to the main bovine attraction, made even better when paired with the restaurant's range of delicious sides. Another popular place for beef, Prime at Le Meridien KL boasts multiple awards as one of the top steakhouses in town. With a premium selection of beef from Australian and Japan, beef lovers won't find it difficult to find their optimal cut at this restaurant. Located high in the sky on the 56th floor of Menara Petronas 3, Marble 8 is another top choice when it comes to steaks, or rather dry-aged steaks in particular. Emphasis is on premium here, so diners can expect world-class steaks to come with a world-class view. An oldie but a goldie, Jake's Charbroil Steaks has been operating in Malaysia for the past 37 years, with four outlets located throughout the city and with one in Langkawi. Wet-aged Australian beef takes the cake here and steaks are cooked and served just like how it was enjoyed all those years ago. If you're looking for a classic, Jake's might do it for you.